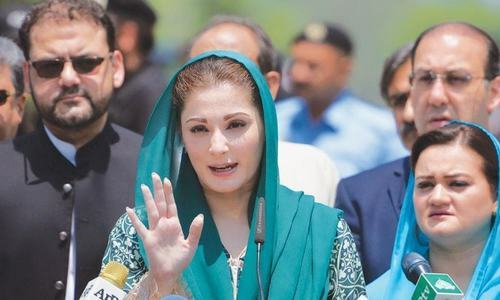 Maryam Nawaz, who has been sentenced to seven-year imprisonment by an accountability court, told reporters on Saturday that she and her father Nawaz Sharif would return to Pakistan on Friday [July 13], before the expiry of the 10-day deadline, to file an appeal against the decision. 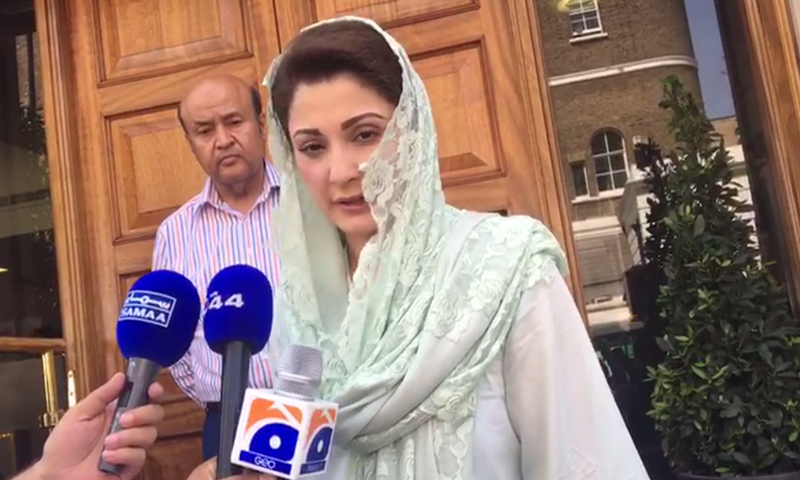 Maryam was talking to reporters in London regarding the Sharifs' conviction in Avenfield properties reference. When asked whether she had been informed by her lawyers that they need to surrender themselves within 10 days to get any sort of relief, she said: "We will go back before that [10 days] anyway." She also claimed that the National Accountability Bureau (NAB) is aware that the Avenfield properties cannot be confiscated since no law had been broken in Britain. She said that even then if the authorities in Britain are moved, it would work in the Sharifs' favour as investigations would make things clear. 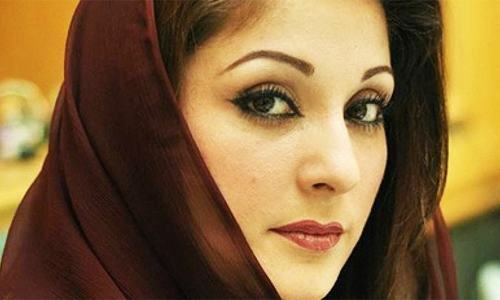 The PML-N fielded Malik Irfan Shafi Khokhar in PP-173 and Ali Pervaiz from NA-127 to contest the 2018 elections in place of Maryam Nawaz, after her conviction led to her disqualification. Ali Pervaiz is the son of PML-N Lahore president and former MNA Pervaiz Malik. Ali had filed nomination papers in this constituency as a covering candidate which he did not withdraw. Earlier he had been allotted election symbol of TV, however, he will now be contesting on the symbol of 'lion' after the party has awarded him a ticket. Malik Irfan Shafi Khokhar is a relative to PML-N leader and former MNA Afzal Khokhar. Sajjad Awan will contest from NA-14 Mansehra on a PML-N ticket in place of his brother, retired captain Safdar, who will also be unable to contest the election due to his one-year sentence. Get Adalah jail ready for three convicted criminals for money laundering, deception, not providing proof of assets and overseas properties and forgery of documents. The end of Nawaz Sharif and his family's 30+ years dynasty! "Avenfield properties cannot be confiscated since no law had been broken in Britain. She said that even then if the authorities in Britain are moved, it would work in the Sharifs' favour as investigations would make things clear"
They only break laws in Pakistan because all these years they were under the impression that they can do what ever they like in Pakistan and that no one will dare challenging them. The scenario is totally change in future they will also not dare to break law in Pakistan, rest assured. As for the confiscation of their famous properties, the British government has a very clear and strong rules against theft, loot, money laundering etc, when the time comes they will know what is in store for them. Welcome back. It will be great if you guys can also bring with you all the looted money back to the land and people it belongs to. Thanks in advance for your understanding, help and cooperation. Appeal only if you can prove the court is wrong. You still have your billions. Hopefully that will be taken away in the future. Arrest them at the Pakistan airport on arrival and take them into custody to transfer to jail before they start another campaign of misinformation and deceit. I don’t understand she wasn’t even holding offices in any previous govts to buy Avenfield Apartments how is she convicted for that???? @Concerned 1 ..She got convicted for aiding and abetting among other things. What a great democratic party - the party tickets in PML-N strongholds all stay within the family or their crony's families. They have right to appeal, and they will. UK courts are not like Pakistani courts. Over there burden of proof is on the prosecution. Our public and whole nation has to start thinking about Pakistan first.if we love Pakistan then we all have to rise above the personal like and dislikes. Money that has been transferred overseas will not be easy to bring back unless Pakistan holds those criminals in jail until money is returned. Same should happen when Maryam returns. Put her in jail. They must come back to Pakistan and prove they are not like Musharraf. 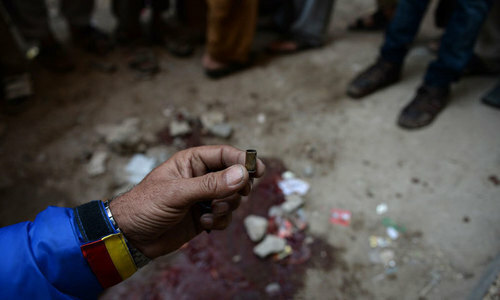 It will gain them popularity and prove that they are law-abiding citizens of Pakistan. @Dr. Salaria, Aamir Ahmad - Pakistan is facing the most shameless, corrupt, dishonest family "Nawaz Shreeif". When we look closely then almost 85% of the PML-N members are corrupt and are being supported by these two brothers Shreeifs. Their children are as dishonest as their parents. Once and for all Pakistan has to take bold actions to eradicate corruption and money laundering if Pakistan has to survive. Maryam! Please don’t forget to bring 2 million pounds for your penalty and 8 million pounds for your father’s if you come back. Although I seriously doubt it. I hope they will be arrested after arrival at the airport. One more lie added to the list. They will never return to Pakistan. If they return, then they are truly stupid. Time for Nawaz Sharif and Maryam to render sacrifice for the nation... come home and spend your jail time (in the interest of democracy and rule of law). any one still supporting PMNL must be respected for their idiotic loyalty. western courties welcome inflow of bribe money, but never let money flow out of there border. Maryam did not have a lot to say for a change. Chances are their convictions will not be reversed on appeal. COME COME WE ARE WAITING YOU. Maybe you (and Maryam) are not aware of the unexplained wealth order law passed in jan 2018 in Uk which places burden of proof on the accused, just like NAB law! @Shy Guy - Nothing to do with being "lions" for these criminals. The trapping of power and luxury is hard to give up for some! @Shy Guy - Nothing to do with being "lions" for these criminals. The trappings of power and luxury are hard to give up for some! @Ahsan. IK is now giving tickets to those corrupt leaders of PMLN instead of his own workers, what you have to say about that. Please read into 'unexplained wealth order' that came into effect a while back. You may be surprised. they will never leave Pakistan alone. @Anti-Corruption_Pakistani court said no money laundering and corruption! They are not coming back and it is loss to Pakistan. Please get all corrupts including government officials to court and recover the government money. She is brave not coward like musharaf. She will definitely come. @Concerned 1 she got punishment for abetting. If you donot understand the meaning please look up google. Either her dad gave her the money the assets, or whoever it was just tell court, simple. It is called money trail. Bravo. Bravo. Ms. Maryam. You will be successful. 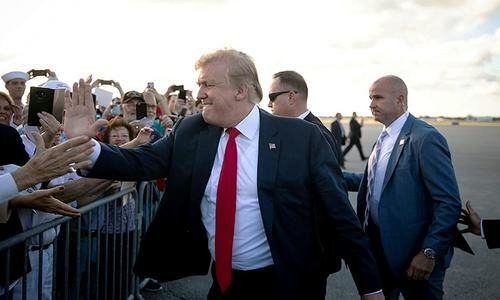 "We the people" are with you. So, they chose to travel by a foriegn airline rather than Pakistan’s national carrier!! Just shows complete lack of trust in country’s own institions by Nawaz Sharif and family! Let the welcoming party get ready with a van, some handcuffs, battons and sticks! They should be whisked away from the Tarmac sraight to Police Station and Jail, without causing a ruckus inside the Airport building. The nation will not be surprised if Begum Kulsoom’s health is claimed by Nawaz Sharif and Maryam to be in serious condition again in order to avoid return to Pakistan!! @Ahsan Gul dont worry most of those currupt hqve already joined PTI and will keep on plundering the state funds in naya Pakistan ! I am an Indian and searching the legal technicalities involved on the judgement. I am studying international and regional laws and only interested in the technicality. If readers from Pakistan can share some pointers/publications on the same, I would appreciate. Thanks in advance for the help. Nawaz Sharif haters in a fix... Having a hard time explaining why he is coming back when he has 3000 crore stashed abroad like Imran Khan has alleged. Today's Nawaz Sharif is yesterday's Imran Khan and today's Imran Khan is yesterday's Nawaz Sharif. Mam please don’t come alone, show your true love and affection for Pakistan and judiciary and bring your two brothers and Mr Dar with you. They are badly needed and declared absconders. 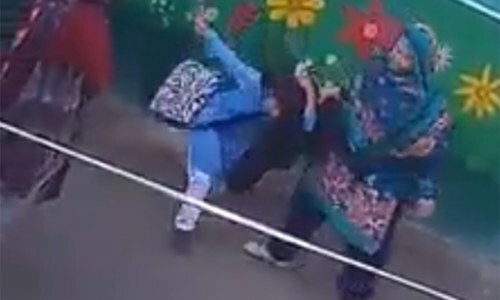 no concern now for ‘Ammi’ condition. that will be their excuse 1 and seek extension of 10-day limit. @Concerned 1 she is convicted for forgery and non cooperation. @Syed Not all cases place burden of proof on prosecution. Prosecution can create doubt regarding source of funds which the owners will then have to clear up. @Concerned 1 His Dad started looting Pakistan in 1985 and buying properties in London and other parts of the World on these innocent kids, Maryam, Hassan and Hussain, these kids were very proud to own the world wide assets, but in the eyes of public, they own nothing, just listen Maryam statements. @Ahsan Gul They have been cleared of corruption charges. Good decision... Now Nawaz sharif should land on Lahore Airport... because by doing this they will gain sympathy vote. @Concerned 1, If you read the verdict you can understand. She has been convicted for abetment in crime. My thinking is no culprit will want to land in Jail. Maryam, you don’t know a thing about a leader or about leadership. A leader always put his people above his personal and family. A leader is honest to his followers. 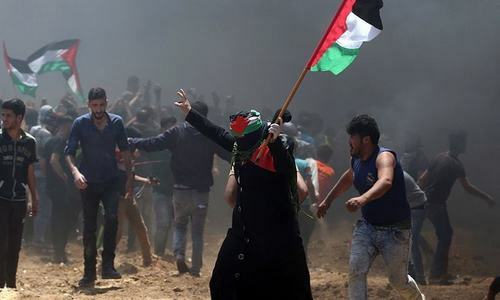 A leader will never have his properties away from his own land. Does Nawaz Sharif your father has these qualities? We don’t think he has any of these!!! I believe they will start another episode of medical drama before Friday may be on Thursday night or Friday morning. Maryam... you will become PM one day. That day is not far. All these are suffering to endure. Next stop - ADIALA ! @Dr. Salaria, Aamir Ahmad , They will never bring any money back. They have chosen to be immigrants in UK. Sharif's two sons have already taken political asylum and succeeded, they are British citizens. Nawaz Sharif and daughter will apply for political asylum sooner or later or there are other options for them to stay indefinitely in the UK. British government will never ever hand them over to Pakistan. A good move. I hope and pray they will be justified and will be able to appeal and have their names cleared after a totally fake and unlawful conviction. Such a pre-decided judgment is a disgrace to our national repute. When u come back bring uncle ishaq Dar seeing as he destroyed our economy. @Ahsan Gul that 85% can be said of entire population. Most of us are corrupt opportunists who are just waiting to knock off the other corrupt so that we can get our turn. That’s our real culture and moral fabric. All those who are giving it name of "sacrifice"... it is not sacrifice, it is punishment which they are enduring for their own mistakes and corruption which have destroyed the nation. Open your eyes. Nawaz Sharif and Maryam will return of Friday to appeal the verdict? Appeal that they're innocent, they were not involved in corruption, they were not involved in money laundering, they did not have secret Panama companies and bank accounts, they did not acquire lavish London properties? If so, why did they not provide proof for the last one year, creating political crisis in the country? If they believe in democracy and accountability, they must accept the judgement based on overwhelming and irrefutable evidence. No politician or his family can be above the law. Mariam has claimed that Avenfield properties cannot be confiscated since no law had been broken in Britain. Of course, knowing the consequences, she could not break law in London. But it was easy for her to break all laws in Pakistan because her father was the premiere. Exactly two years ago, in July 2016, on her visit to USA, Mariam was presented a cheque of $70 million by Michelle Obama to educate the adolescent girls in Pakistan. Apparently Mariam pocketed $70 million as no report has been published as of today that she spent even part of that amount to promote the girls education. The case lodged against her was probably never heard because her father was the premiere. The announced punishment for these and similar other convicts should not be the Jail Term and Relatively Small Fines. The real punishment should include complete recoveries of the nation's loot and confiscation of ALL of their properties in and out of Pakistan. Once that is done, set them free to live under the miseries that majority of the Pakistanis live. Only then a loud and clear message will go out and Pakistan will move towards a prosperous path. Fight it out. That's the best bet !!! @Ahsan Gul you can not say now that 85% of corrupt are in pml n, they all have jumped ship and do you know which party they all have joined. Yes those 85% and 85% of ppp have all joined pti and shaken hands with imran khan. Enjoy the tabdeeli and making of the new Pakistan by the 85% of corrupt N leagers !! @SK This is what called "vote koh izzat doh" or to be more precise "hamari corruptio koh izzat doh" through giving tickets to most of their family members as per democratic norms. She wants to emulate BB but sadly mistaken as BB was a great personality she is nobody. Arrest on arrival. Just like Sharjeel Memon. Fine imposed on Sharif family is peanuts compared to billions they have stolen from Pakistan during the last 30 years while in power.. Pakistan cannot have access to their overseas accounts as Nawaz the godfather himself admitted that no one keeps those stolen money accounts in their own name. ‘Maryam Nawaz has 1506 kanals of agricultural land and has millions invested in companies’; where has it all come from? Has she been paying Taxes on income generated from these assets? Welcome back, nation need you. I will support you guys no matter what. Sherrrrrrr. Maryam said that NAB cannot put hands on Avenfield properties in England as they were purchased properly. Maryam you guys bought those properties with the money of poor people of Pakistan. 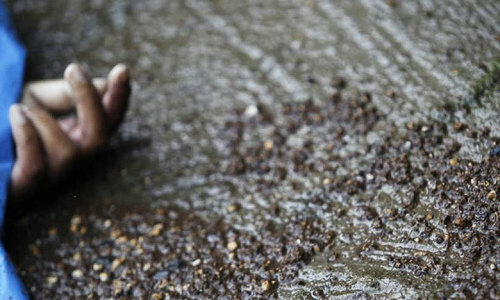 Dirt poor people and some of them can’t afford to buy slippers for their feet. Don’t you or your family members are ashamed how you guys stole all that money. There is a poetic justice if you do believe and you guys eventually will pay. Great Decision. The War begins.. They should to at least save Nawaz’s brother and her husband or else they are done. @Concerned 1 because you are ignorant just like them. Please read up on logic then you can take baby steps to understand this. Musharraf was never found guilty of any crime including any corruption or of financial crimes. The charges against Mushraff were malicious and frivolous leveled by Nawaz Shariff motivated by his personal hate and driven by his ego. There is no comparaism between both of them. PML N giving the tickets to their relatives. Or what else is the criteria? In 1970 the know it alls could see Bengal going it’s way. Let us hope they can see that discounting the wishes of at least half the people by railroading their leaders into jail will weaken the remainder of Jinnah‘s Pakistan greatly. Be careful what you wish for. Making Nawaz and Maryam into Martyrs is fools gold. Imran has lost regardless of the result and not one vote has been cast yet. Welcome, and in one weak time you will see how the things will change in one room without fan and window. @Abdulla Hussain ..a country like UK talks about the moral values should look into the case and the property should be handed over to pakistan...but again do they care...for they want the third world to be third world...eventually ...If a free society cannot help the many who are poor, it cannot save the few who are rich. 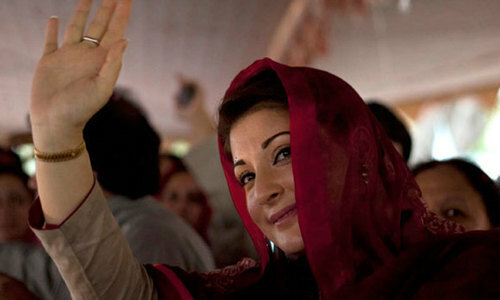 What do you know about nations who have never worked in her life but still own millions of rupees properties? Hopefully, we have a revolution in Pakistan where corrupt like your father and families will be investigated, prosecuted, their properties confiscated and thrown into jails. Those days are fast approaching in Pakistan. how arrogant can people become in power. they think they will live forever and conscious dies. @Ahsan Gul Out of 85% how many have joined clean Party PTI. How can you justify this change of loyalty?Can IK claim that he had very honest and corrupt free people with him. @SK It's like our Congress Party in India. The so called Gandhi's ( they have little to do with the great Mahatma ) are looting. I express our solidarity with corruption free democratic Pakistan. IF trial is held in England, there will be no Judicial coup. @Zaheer I am sure you will be disappointed if they return. Get ready they are coming. If they return as what they says, I can say they are not like other absconders. Brave daughter of Brave Father. I pray for early recovery of her ammi. Chance are bright (after verdict against them) for getting more votes from People of Pakistan to their party. Take them to jail first from the airport and than they can file for any mercy. Hope they are not given any pre arrest bail or any kind of leniency. Will she and her corrupt father go to regular jail with other common criminals! @ Raja Abbas Aiding & abetting what? She was a minor when the properties were presumably purchased (?). She is getting punished to discourage the rest of us from ever standing up to our military and judicial saviors. The other reason is to pressurize her father into submission. I hope they fail on both counts. Pakistan public has to continue the fight against corruption and lawlessness, including fight against both political dynasties Sharif and Zardari(now who proclaimed themselves as Bhuttos). End of the dynastic rule . This is a tough and brave decision knowing the prevailing conditions are so hostile towards the family and they are up and against an alliance. However, if you (Maryam) are choosing a political life (very risky) than it is a correct decision and you will more stronger and maturer in the long run. Good luck with that venture against a deadly alliance. it is not significant whether they reutrn to the country or not.what is important for us and the cause of concern is that they are polticising corruption.they are adamant of any wrong doing. it seems they consider it their birth right or lawful to stash public wealth and build empires. unfortunately, the people still are doubtful of their integrity when everything has been cleared by the accountability court and JIT they are niether honest not truthful but corrupt, dishonest and the plunderer of the highest degree.one can hope that the this accountability process will not stop and more bigwigs will see the light of the day, which include zardari and his associates and lackeys of imran. I doubt they will return on Friday.. am sure Kalsooms worsening condition will prevent them, or that is the excuse I see coming from them! Of course I wish the best of health to Kalsoom but ..
@Dr. Salaria, Aamir Ahmad I hope what you said is trye. Knowing the Family, they will die rather then bring money back to the Country/People it belongs to - Maybe on Thursday night the Ventilator will be removed to have excuse not to return? Sharief's are materialistic, you can expect the unexpected. Apeal? On what ground. Sharif was allowed ample opportuinity to provide money trail.to prove his case that the property in London was purchased from his own income resources. The point is not that the property was purchased through committing corruption. The point is that how the property was purchsed by the minors when these minors were fully dependent on father and apparently did not have any apparent or visible financial resources to make such a big deal independently. There are strong presumptions that the transaction.was done with the help.of father who was holding a high publc office that ultimately led to.the conclusion.that father took undue advantage of his public position.committed an embezzelement with public money directly or indirectly. How selfish! They always want something for themselves only. They never do anything other than what is good for them only.